If you've read any articles on this blog, or followed my @tutormentorteam posts on Twitter, you've seen graphics like the one below. The message in both graphics is the same. We need to reach kids as they enter school and support them with a wide range of mentors and learning experiences as they move through school and into adult lives. While all kids need this support, for most kids, it's naturally available through family, neighbors, faith groups and community. For kids born or living in high poverty, such support is less available, and organized, intentional efforts, are are needed to make mentor-rich support programs available. 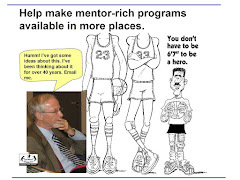 Having led such a program for more than 35 years, I know how difficult it is to build and sustain such programs. I posted this Tweet and my graphic in this article last weekend. I'm adding more detail to my explanation in today's post. 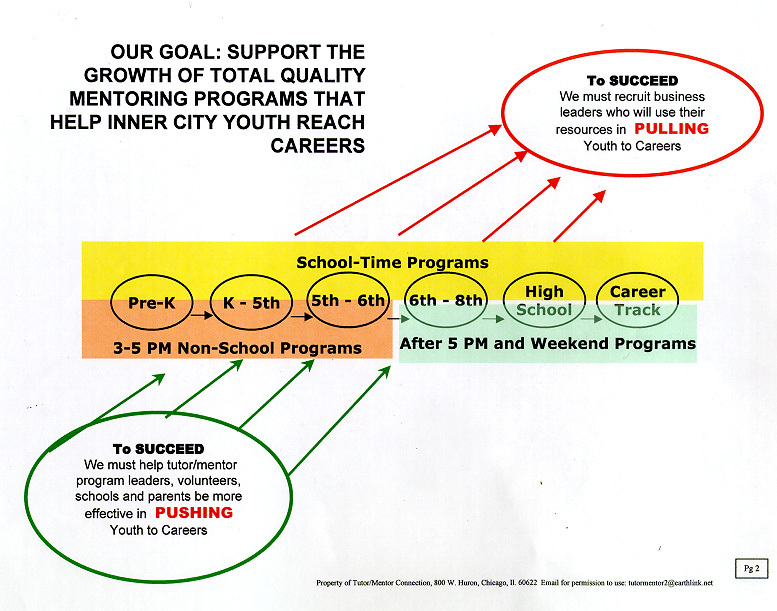 In the middle of the graphic is the birth-to-work arrow that I've used since the mid 90's to visualize age-level supports that volunteers and businesses could provide to youth, via well-organized tutor/mentor programs as well as schools. At the top of this graphic is the question. What can universities do differently, that might be a tipping point in terms of making well organized programs available in more places, for more years, reaching more youth, and helping them through school? I answer by saying "build a pipeline of leaders, who work in these programs, and who work to provide the talent and resources needed by each program on an on-going basis". So I added an overlay to the Birth to Work arrow to suggest this idea. If you strip away the arrow, this is what's left. Imagine a four to six year masters or PhD level college program, starting the freshman year of college. Then visualize on-going practical learning, in which college students serve in existing programs, reaching youth as young as elementary school, with their service tied to course work being studied on campus at different points over their college career. Imagine part of what college students are teaching youth in middle school and high school, is drawn from the same "how to" lessons that college kids are studying. If students begin thinking of what it takes to make the programs available to them, which they are part of, they will have momentum if they choose to pursue this course of study in college, and as a career. If colleges just did the first part of this suggestion, they would be reaching youth in neighborhoods surrounding the college and enlisting their students and alumni in various roles that help PULL kids through k-12 school, and into college, then on into jobs and careers. If this were a continuous program, lasting for decades, it might dramatically close the opportunity gap. However, that's not enough. Volunteers need a safe, well-organized place where they can connect with kids, and stay connected for many years. Such places are constantly seeking dollars, volunteers and other resources, but are not equal in their abilities to attract those resources. Thus, too few programs are available. Here's the TIPPING POINT: The curriculum I am suggesting is not limited to just those going into direct service. It's a college wide humanities type course that engages students studying in different fields, most of whom will go into the business world. Imagine that each year's class of graduates from a university include a few with degrees showing them to have a full knowledge of how to build and lead a mentor rich youth serving organization. And then imagine another group of graduates, leaving college with an understanding of what it takes for such programs to succeed, and the role they can take in PROACTIVELY providing dollars, talent, technology, volunteers and other resources needed, including jobs, internships and learning opportunities for youth in organized tutor/mentor programs and public schools. Then, imagine that people from both groups spend time daily, or weekly, in on-line affinity groups, supported in part by universities, and students who are working toward their degrees, where they keep learning, from the college, and from each other, so they are constantly seeking to do more and do better, at helping kids move out of poverty, or helping solve other complex problems facing the world. 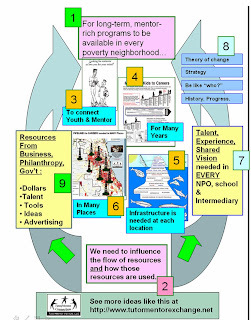 I've attempted to communicate this idea in the past using this graphic, which you can find in this series of articles. The problem, as I see it, is that most adults don't have time to dig through my articles and learn what has taken me 40 years to learn. Most are not motivated to do this, nor guided through this mountain of information, they way faith leaders and college professors guide students through other information resources. So what types of curriculum would students study? I started building a list on my original graphic, and I've already expanded it with the graphic below. I suspect that others could add more, if they just spent time thinking about it. As you look at the list of skills needed, compare them to courses required by colleges preparing teachers, social workers and/or business leaders. I doubt that many are required to learn spatial thinking tools like GIS mapping, or concept mapping. Or that they are asked to learn basic coding, so they can oversee a web site or blog, to communicate ideas. I doubt that many are learning ways to support digital learning in on-line communities, or the creation of digital content that can be used to share ideas and promising practices. 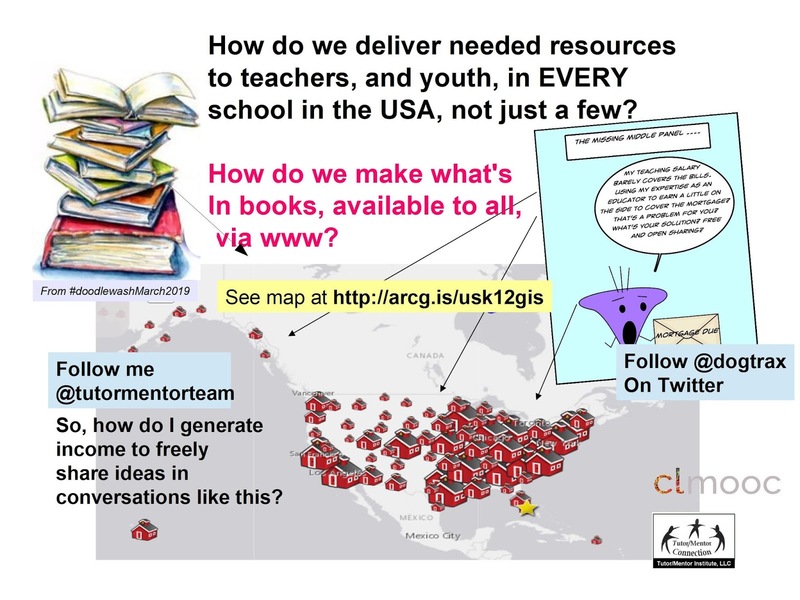 I mentioned that the #clmooc group is reading a book titled Affinity Online: How Connection and Shared Interest Fuel Learning. They have created many pathways into joint reading of the book, and point to many who are reflecting on what they are reading via their blogs. I've been impressed by the amount of time many of these young people are spending in these groups, building new skills, taking on leadership and organizational roles, mentoring and guiding new members, etc. Imagine that level of learning embedded into the DNA of graduates of the type of program I'm imagining. Wendy Taleo, from Australia, is a member of the #clmooc group. 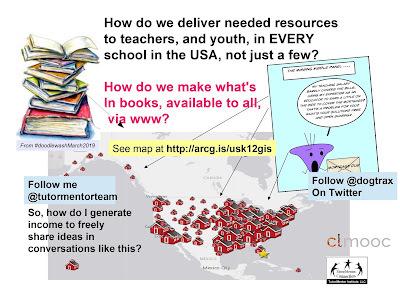 She posted a graphic today, which I annotated with my own #hashtags, suggesting my goal that people from many different sectors join together in on-line learning. 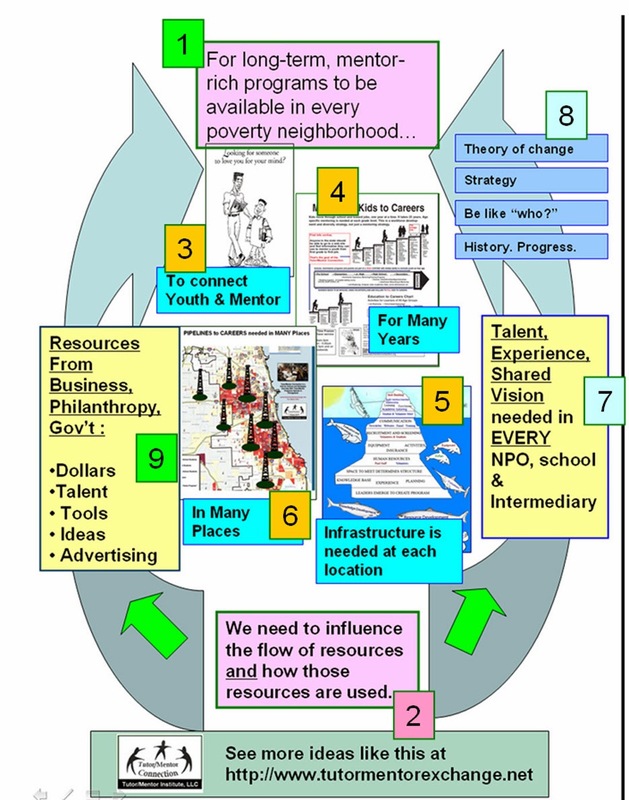 To me, this graphic also represents how students, alumni and community members, including youth, would be connecting in on-going learning to better understand complex problems, and learn about actions being taken in some parts of the world, that might be applied in other places, if resources were readily available. If alumni who are working or have been blessed with wealth are in these conversations they would be ready and able to offer support where needed. 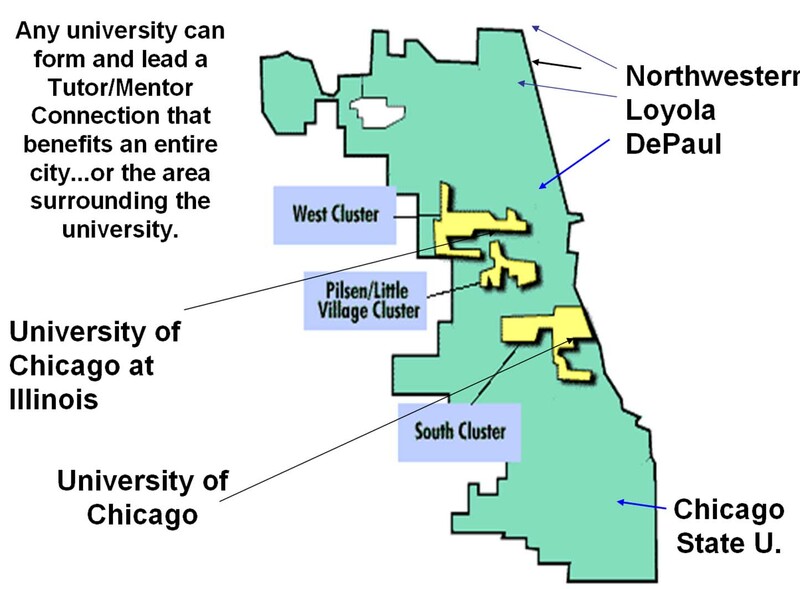 I've been reaching out to universities in Chicago and beyond since the 1990s to find one that would adopt the Tutor/Mentor Connection/Institute, LLC as a strategic partner. Here's one of many articles showing this invitation. It just takes one college to pilot this, and one wealthy benefactor to provide the financial incentive for a college or university to take this role. Look at the graphic below. Imagine each of those red school icons being a place where an alumni with a Tutor/Mentor Institute degree from your university were on the staff and that others were volunteers, board members and/or donors. Can you visualize having such an impact? This is not intended to help one, or even a few, great youth programs grow. 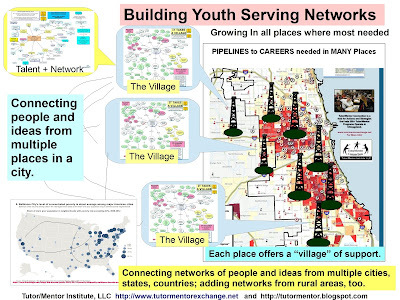 It's intended to fill a growing number of high poverty areas across the US and the world with great, constantly improving, well-supported youth tutor/mentor programs that are recognized as world class, by the degrees of their leaders and by the work they are doing. That's it for today. I look forward to reading some one else's interpretation of this idea. In the meantime, if you value what I'm writing about, please consider a contribution to help me pay the bills. Click here and use PayPal to send your support today.